Reimagining the 1769 Transit of Venus | Unofficial Britain. In a small Lancashire Village in 1639, Jeremiah Horrocks was looking through his telescope and beheld the most unusual sight – the planet Venus crossing the path of the sun. He was the first in the west to witness, and record, the transit of Venus, an astronomical phenomenon which occurs every 243 years. In 1716, Edmond Halley (he who named the famous comet) called on astronomers across the world to record the phenomenon. But it wasn’t until June 3rd, 1769 when British navigator, Captain James Cook managed the feat while on the island of Tahiti during his first voyage around the world. With him were British naturalist, Joseph Banks, British astronomer, Charles Green, and Swedish naturalist, Daniel Solander. Unofficial Britain is proud to present a unique musical interpretation of this event by London-based Australian musician and composer Rhia Parker. “Inspired by the 1769 Transit of Venus, Transit / Diesis (for voice and recorders) explores the metaphor of the parallax in relation to musical, scientific and poetic manifestations. The structure of this 30 minute piece is based upon the observations of three astronomers during the 1769 transit, whilst the musical material is sourced from Kelper’s ratio’s of the planets (Venus being 24:25 or a diesis). Submerged within this musical realisation of the transit of Venus are two re-workings of the 13th century Cantigas de Santa Maria. The first (for voices) is based upon the writings of the Renaissance scientist Evangilista Torricelli; ‘We live submerged within an ocean of air’. The second (for five bass recorders) re-interprets the Cantigas Ay Santa Maria. 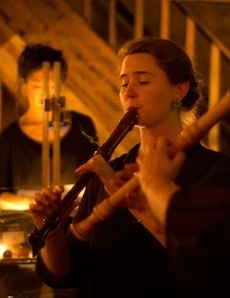 Rhia Parker is a recorder player, singer, composer and collaborator. She has composed work for the Sydney and Adelaide Fringe Festivals, toured Australia with BighART’s theatre production of Namatjira and performs regularly in London with her recorder duo Gold Vox.